PCWin Note: Bopup Messenger 7.0.2 download version indexed from servers all over the world. There are inherent dangers in the use of any software available for download on the Internet. PCWin free download center makes no representations as to the content of Bopup Messenger version/build 7.0.2 is accurate, complete, virus free or do not infringe the rights of any third party. PCWin has not developed this software Bopup Messenger and in no way responsible for the use of the software and any damage done to your systems. You are solely responsible for adequate protection and backup of the data and equipment used in connection with using software Bopup Messenger. IMbrella - IM can help your business be more productive, but only if its used effectively. Restricting employees to messaging only with co-workers, customers and vendors means enhanced productivity, faster customer service and a more streamlined enterprise. OnLAN Messenger - OnLAN Messenger - Enterprise product - messaging service is a client-server multi-user application for instant messaging and file exchange (instant messenger). BigAnt Office Messenger 2.92 - BigAnt Office Messenger is an instant messenger tool for Lan and internet network. Support Windows 7, Mac os X, Android and Blaceberry. OSS DVD Video Image Extractor - DVD Video Image Extractor is a free powerful tool to easily and effectively extract or capture images from your favorite DVD-Video discs and save it on your local hard drive. You can extract one image(single, Continuous and timed). More Software of "B Labs"
Bopup IM Client SDK - Bopup IM Client Software Development Kit (SDK) is a toolkit for Windows platform that provides documentation, samples and COM components for building powerful instant messaging (IM) functionality into existing applications, developing chat software. 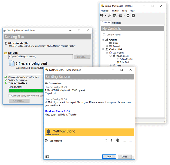 Bopup IM Suite Enterprise Pack - Secure client/server instant messaging suite designed to provide efficient chat and communication capabilities over LANs and networks of any size. This bundle includes a license for Bopup Communication Server (IM server) + 100 instant messengers. Bopup IM Suite Standard Pack - Secure client/server instant messaging suite designed to provide efficient chat and communication capabilities over LANs and networks of any size. This bundle includes a license for Bopup Communication Server (IM server) + 25 instant messengers. Bopup Scanner - This freeware portable network scanner displays active computers with logged user names (NetBIOS), MAC and IP addresses. It also detects and shows HTTP (Web) servers running on remote computers (TCP port 80, 8080) and can accept an IP range to scan. Bopup Messenger for Android - This app allows to exchange messages and communicate with users connected to the same communication server software from mobile and desktop-based messaging clients. Instant messaging is strongly encrypted and logged on the self-hosted IM server.